Poinsettia's cousin, Euphorbia features picturesque names and peculiar blooms. Snow-on-the-mountain (Euphorbia marginata, top) and snow-on-the-prairie (E. bicolor, below) are easy to recognize. They populate pastures, prairies, gravel flats and roadsides. Erect stems stand 1 to 4 feet tall and are lined with stalkless oval leaves. Near the top, stems typically divide into sets of three branches, topped with white flower clusters that catch and reflect the sun’s rays. Appearances can deceive. Viewed at close range, those blooms aren’t pure white, and the most visible parts aren’t flowers. To appreciate these wild Euphorbias, it helps to think of their tame cousin, the Christmas poinsettia. The bright red “petals” of a poinsettia aren’t really petals, but modified leaves called bracts. The real flowers are small and inconspicuous, clustered within special structures called cyathia, which are unique to this genus of plants. Euphorbia’s true flowers are so tiny, you may need a magnifying lens to see them. Each cyathium contains a single female flower and up to 30 male flowers. Nectar glands at the edge of the structure have rounded appendages that resemble petals. The showy bracts below the flower clusters are green with white margins. In E. bicolor, bracts can be up to 4 inches long and quite narrow. Bracts of snow-on-the-mountain tend to be shorter and wider. Aside from that, the two species look much alike. They are annuals, completing their life cycle in one season. If successfully pollinated, the female flower will produce a distinctive green, three-lobed fruit. Blooming late July through October, these plants can be seen most places in Texas. Snow-on-the-mountain is more common in the western half of the state, while snow-on-the-prairie prefers the hard clay soils in the eastern half. They often form large colonies, partly because they can grow in poor soils where many other plants won’t, and partly because their stems contain a milky latex that discourages grazing animals. The latex is slightly toxic if eaten, and can irritate skin and eyes. However, mourning doves can safely eat the seeds of these wildflowers, and butterflies enjoy the nectar. 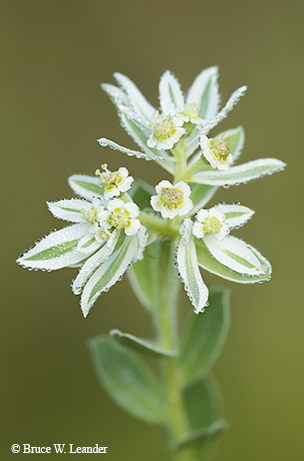 Does a crop of Euphorbia in bloom, with white-edged bracts flashing in the sun, really look like a snow-covered pasture? Most Texans would not be fooled. But these flowers do tell us that summer is progressing into fall, and cooler weather can’t be too far ahead.